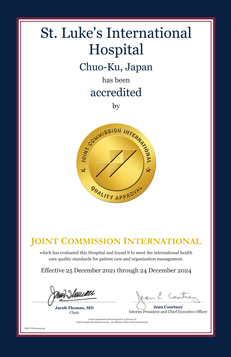 St. Luke’s International Hospital was first accredited by the Joint Commission International (JCI) in July 2012, and after undergoing a re-accreditation survey in July 2015, accreditation has been renewed. Re-accreditation applies to all 5 previously accredited facilities, namely, St. Luke’s International Hospital, St. Luke’s Affiliated Clinic and Center for Preventive Medicine, St. Luke’s Birth Clinic, St. Luke’s Home Care Service Station, and St. Luke’s MediLocus. 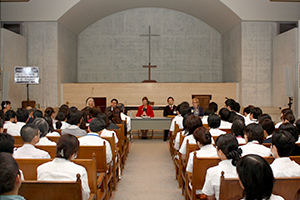 St. Luke’s basic Objectives of the Hospital Management specify, “To ensure quality medical care, we practice ‘evidence-based medicine’” (item 2), and “To fulfill our role as an international hospital, we prepare to accept patients from abroad” (item 7). 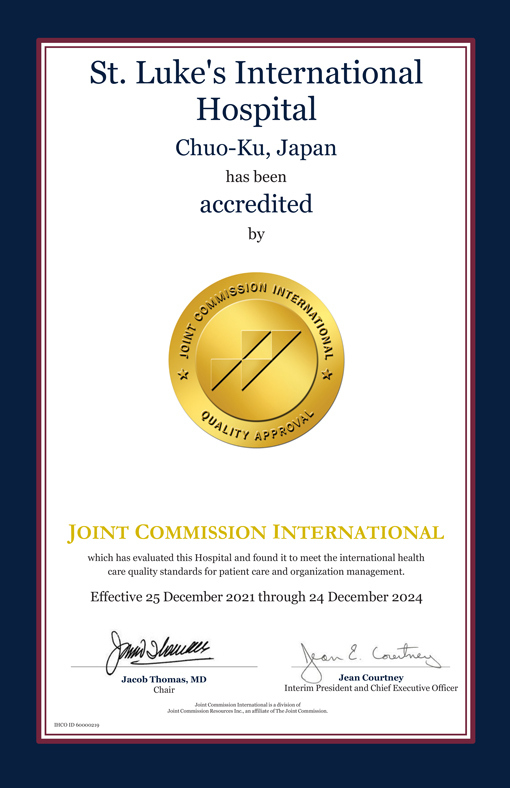 We believe that JCI accreditation is also an essential way of guaranteeing to our patients from abroad that the medical service we provide satisfies international standards. We diligently strive to continuously improve the quality of our medical care and promote the highest level of safety concerning all aspects of this hospital, in awareness and anticipation of medical and social changes, while we maintain and develop the provision of healthcare that meets JCI standards. JCI is the acronym of Joint Commission International, an international nonprofit agency that was established in 1994 as a branch of The Joint Commission, a third party agency that assesses and accredits medical institutions in the United States of America. 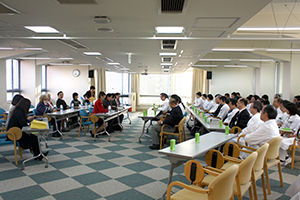 A total of 1145 measureable elements divided into 14 sections including such headings as “patient safety,” “infection control” and “quality and improvement of medical care,” are evaluated. Institutions are accredited after it has been assured that global quality standards are met and that safe medical care is provided. JCI accreditation has been extended to 771 medical institutions in 64 countries, and in Japan these are 9 medical institutions including St. Luke’s in the hospital program, 1 university hospital in the academic medical center program, 2 clinics in the outpatient program, and 1 institution in the long-term care program (as of July 2015).